For 150 years, Le Scribe, managed by Sofitel, has been beating to the vibrant rhythm of Paris and the Opéra district. Today, this institution is undergoing a major transformation that will end in late 2019: an opportunity to write a brand new page in its history, with the ambition of embodying the new Parisian spirit. Since its creation in 1863, Le Scribe has been an essential part of Parisian life. First chosen as the headquarters of the prestigious Jockey Club, it was the meeting point for the elite of French and European society during the Second Empire. A true scene of the modernity that saw the birth of cinema, with the Lumière brothers’ very 1st world projection in 1895. The hotel was also the stronghold of many visionaries and artists such as Josephine Baker. Today, Tristan Auer, the artistic director of Wilson Associates and recognized as a leading figure in design, has been chosen to redesign Le Scribe. A metamorphosis thanks to which the hotel wishes to embody the new Parisian spirit and strengthen its anchorage in the sumptuous Opera district. At the beginning of March, Le Scribe unveiled its new visual identity, in line with the Parisian design style conveyed by Tristan Auer. Impregnated with its Parisian history while embodying modernity, Le Scribe claims a collaborative approach: the various stakeholders of Le Scribe (guests, local residents, hotel staff) are invited to co-createthe hotel’s new offers by taking part in a survey that therefore aims to put the customer back at the heart of Le Scribe’s spirit. For a definiteParisian experience. 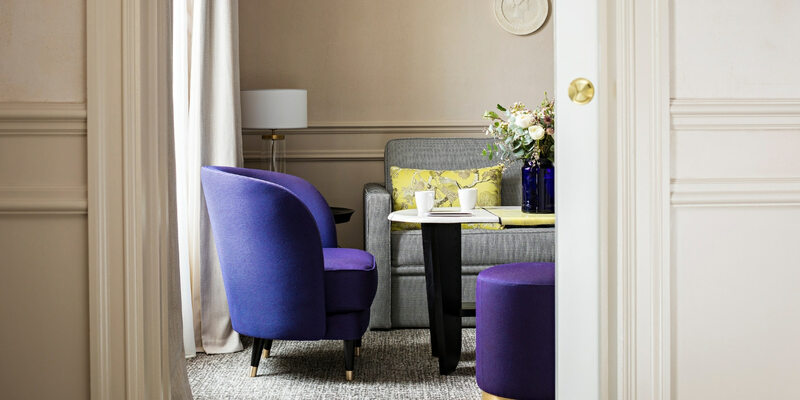 The hotel’s rooms and suites illustrate with finesse and style the vibrant city of Paris which represents the French way of life. Enjoy the delicious tapas of Chef Sébastien Crison or try the spectacular cocktails of the hotel’s mixologists... Opened in 2019, the Café Scribe is a hybrid place, both chic and relaxed, where tradition and creativity blend together. Discover (or rediscover) this space entirely redesigned. The extra? Hugo & Victor travel cakes, exceptional coffees from Terres de Café and a selection of infusions and teas from Artefact will will delight you. The Lumière restaurant’s cuisine is part of the great French culinary tradition of Le Scribe, while the lobby is the perfect combination of both the authentic and the contemporary. Discover the interviews of lifestyle blogger Mr. Xiaomao, and General Manager of Le Scribe Béatrice Schopflin.